John Cahn, an emeritus senior fellow and materials scientist at the U.S. Commerce Department's National Institute of Standards and Technology (NIST), was named today to receive the prestigious Kyoto Prize in Advanced Technology. Cahn's numerous major contributions to materials science include developing a fundamental theory that describes the behavior of mixtures of different materials and how they tend to separate at the microscale. The theory established an entire branch of materials research and is particularly important to the rational design of new alloys. Awarded annually since 1985 by the nonprofit Inamori Foundation, the Kyoto Prize is Japan's highest private award for global achievement, and honors significant contributions to the betterment of society. The focus of this year's award for advanced technology is materials science and engineering. The prize includes a diploma, the Kyoto Prize medal and a cash gift totaling 50 million yen (~$625,000), awarded during a week of ceremonies beginning Nov. 9, 2011, in Kyoto, Japan. "We're so pleased to see John receive this outstanding recognition," said NIST Director Patrick Gallagher. "His work in understanding nature's rules for atomic structure within metals and other materials has had a profound effect on us all. It has enabled faster, more advanced materials design for many of the high-tech products we use every day." Computer generated movie shows, based on the Cahn-Hilliard equation, how a uniform but unstable mixture gradually separates into regions of the two components. (Green represents a 50-50 mix of the two components; red and purple represent 100-percent concentrations of each of the two components.) In many materials, such as metal alloys, this unmixing or "phase separation" leads to a distinct microscopic structure that plays an important role in the material properties of the alloy. The same general equation describes phenomena ranging from the clumping of lipids on the surface of a cellular vesicle to the formation of galaxies. "John's developments in the theory and models of materials have given scientists tools to understand and make new materials ranging from metals to plastics to ceramics and glass," said NIST metallurgist Frank Gayle. "For instance, your smart phone or laptop computer might contain 100 different materials, and John's work has probably influenced the understanding and development of half of those." Practically all metals in use today are alloys, mixtures of two or more pure metals that, combined, have superior properties to either alone. The world's first known alloy, bronze, is significantly harder than either the copper or tin that are melted together to form it. Bronze was so revolutionary that a historical era is named for it. Alloys are not always uniform, homogeneous mixtures. At the microscopic scale in some alloys the different elements tend spontaneously to separate slightly in twisty, random clumps, a phenomenon called "phase separation." Unlike crystallization, in which one component of a solution separates out to solidify at discrete starting points (think of making rock candy), this separation happens simultaneously throughout the mixture. The phase separation and related changes in microstructure play a key role in determining the physical engineering properties of the bulk composite alloy—things like strength, toughness, ductility, magnetic strength and thermal conductance—but before the work of Cahn and his collaborator John Hilliard, then at General Electric, there was no good mathematical description of how this separation occurred. Developing a new alloy to meet specific material requirements was a painfully long and expensive process of trial and error. The Cahn-Hilliard equation supplied that basic framework. The equation describes, quantitatively, how the components of a binary mixture that becomes unstable when cooled will separate through a process called "spinodal decomposition. "* Cahn proceeded to elaborate the theory, showing how basic thermodynamic principles could be used to design alloys that, under spinodal decomposition, would form desired microstructures. His work laid the foundation for the rational design and manufacture of new materials using the Cahn-Hilliard equation as well as for the related "phase-field" method, which uses similar thermodynamic considerations to model the behavior of complicated interfaces in materials. 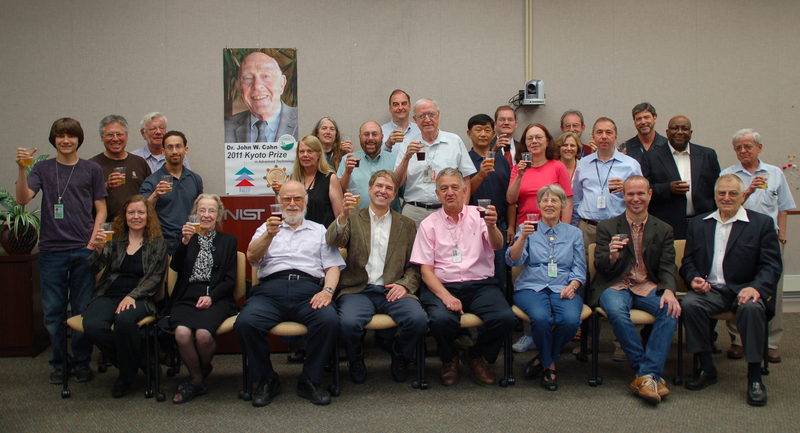 Colleagues at NIST raise a toast to John Cahn for being selected to receive the 2011 Kyoto Prize. Born in Cologne, Germany, in 1928, John Werner Cahn received his doctorate in physical chemistry from the University of California, Berkeley, in 1953. He taught at the University of Chicago before joining the Metallurgy and Ceramics Department of the General Electric Company's Research Laboratory in 1954. In 1964 he became a professor in the Department of Materials Science, Massachusetts Institute of Technology. In 1977 he joined the National Institute of Standards and Technology, then called the National Bureau of Standards. He served in various senior positions in NIST's materials science research laboratories, and is currently an emeritus senior NIST fellow in the Institute's Material Measurement Laboratory, as well as an affiliate professor at the University of Washington. Among other honors, he has received the Acta Metallurgica Gold Medal (1977), the Materials Research Society Von Hippel Award (1985), the Japan Institute of Metals Gold Medal (1994), the U.S. National Medal of Science (1998) and The Franklin Institute's Bower Award (2002). He is a member of the American Academy of Arts & Sciences, the Japan Institute of Metals, the National Academy of Engineering and the National Academy of Sciences. In Arts and Philosophy, Mr. Tamasaburo Bando, an international theater performer and renowned Japanese Kabuki actor specializing in female roles. For more information, see the Inamori Foundation announcement, "The 2011 Kyoto Prize Laureates." * In thermodynamics, a "spinodal" is a graph showing the critical conditions at which a mixture can easily separate into its components.